Teaching reading should follow a systematic, structured and progressive framework. It should also be sympathetic and reactive to the needs, current questions and development of the children. As in all learning, we need to structure our programme in a spiral, constantly revisiting previously learnt concepts but at a progressively higher level. If we don’t do this it is like asking a child to climb a ladder with the bottom rungs missing. 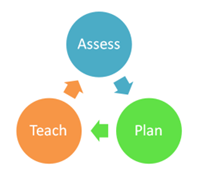 Planning should also be directed by assessment with a clear goal as to what is to be achieved and how it will be achieved and not forgetting, how we will know that it has been achieved. Benchmarks will provide you will a clear direction in the achievement of a Level.